The AmSouth Riverchase project is an administrative office and training center complex located in the Riverchase development of Hoover, Alabama. NLA's work initially consisted of a master plan program under the direction of Chicago architect Lohan Associates, for the heavily wooded 172-acre site. NLA assisted Lohan Associates in the complete site design for the 94 acre Phase I portion of work. 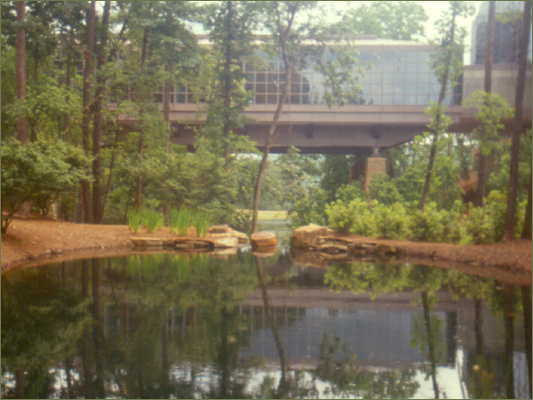 This included siting two administrative office wings connected by a raised dining bridge, overlooking a designed lake and waterfall. NLA provided design of walking trails, waterfall design, aesthetic grading, forest preservation, landscape planting, and landscape irrigation.